All those identified as authors should meet all four criteria, and all those who meet this criteria should be identified as authors. It is the author’s responsibility to decide on the listed authors and the order. As a guideline, supervisors are generally identified as the senior (last) author of a manuscript, with the primary author being listed first. The AMSJ accepts co-first authorships in the event multiple authors contributed equally to the work. Authors should be able to identify which co-authors are responsible for specific parts of the work. Those who do not meet all four criteria should be acknowledged with specified contributions. If authorship is disputed, this should be resolved at the institution(s) where the work has been performed according to the ICMJE recommendations. If changes to authorship are requested for appropriate reasons, agreement from all authors is required in writing following the COPE flowchart. At the time of submission, the corresponding author will provide conflicts of interest statements. 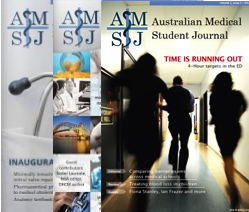 The Australian Medical Student Journal recommends current staff do not submit articles for consideration of publication. However, if articles are submitted, the author will remain de-identified during the selection and editing of articles. At the time of the invitation, reviewers are asked to disclose any conflicts of interest that could affect their review. AMSJ editors will ensure all relevant conflicts of interest are declared in publication. AMSJ editors will ensure unbiased reviews by not seeking reviewers with conflicts of interests. Prior to the publication, all articles are run through the plagiarism check via the plagiarism detection software (iThenticate). If plagiarism is suspected, AMSJ will take action in accordance with the COPE flowchart. In accordance with the COPE guidelines, the AMSJ ascertain the integrity of the peer review process. The AMSJ operates a de-identified peer review system, where identities of both authors and reviewers are protected. not sharing submission materials and information with third parties. not using or taking advantage of the submission materials and information to gain personal benefit. The AMSJ follows the COPE flowchart for duplicate publications. Duplicate publication is the publication of the same material more than once. Authors agree that when they submit, their work is not submitted for consideration at another journal and has not been previously published (see section 4.5 for exceptions). If an author publishes with the AMSJ, this cannot be published elsewhere. Authors will retain copyright of their submissions. By submitting, authors are only providing the AMSJ with a license to publish the submission as the first publisher. This obliges the author to mention the AMSJ as a source if they later republish the submission on another platform. Authors published in the AMSJ are free to submit to other journals that accept previously published work. However, authors should realise that they may not be able to submit their published work to other journals that only accept original work not previously published elsewhere. In accordance with the ICMJE, manuscripts analysing the same data set but with different analytic methods and/or conclusions must cite the primary publication. Studies involving animals and humans should include a statement on ethics approval by an ethics committee or institutional review board. Studies involving humans should include a statement regarding consent to participate in research. Case reports should be de-identified. When submitting to the AMSJ, authors acknowledge consent has been obtained for the case to be published via the submission form, and authors should retain a signed consent form.